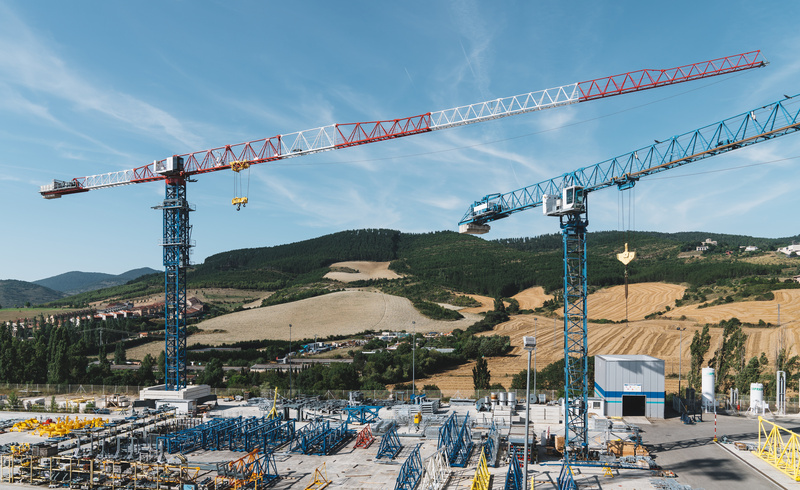 COMANSA, one of the world’s main references in tower cranes for construction, launches to the worldwide market a new model designed to work in projects in which it is necessary to lift heavy loads. The new 21LC1050 is offered with versions of a maximum load of 25, 37.5 and 50 tonnes and can be erected with reach of between 30 and 80 metres with configurations every 5 metres. In addition, an optional jib configuration is available allowing a special reach of 85 metres. The characteristics of load, reach and mechanisms of the 21LC1050 make this model ideal to offer an optimal result in large industrial or mining projects as well as for the construction of buildings with prefabricated and steel structures of great tonnage. The design of the slewing (horizontal) part of the 21LC1050 is similar to that of the successful 21LC750 and 21LC660. Instead of having a cusp element, the jib and counterjib join directly on the slewing part, which allows a much faster and safer assembly. The 21LC1050 also shares a large part of the jib and counterjib sections with its "little siblings" 21LC750 and 21LC660, which allows optimizing the investment to customers who already own these models. Among the novelties presented by the 21LC1050 is the design of its counterjib, which, like the jib, allows numerous different configurations to better adapt to the needs of each job. Always having a counterjib radius as short as possible avoids possible interference with buildings or other cranes present in the same project, thus increasing safety. The complete structure of counterjib consists of 5 modular elements that allow up to 6 different configurations. Thus, when the crane is assembled with a maximum range of 80 metres, the counterjib radius is 31 metres, being able to reduce, for example, to 27 when the jib is 50 metres, or to 21 when the reach is 30 metres. In addition, the counterjib radius in all its configurations can be reduced by 1 additional metre with steel counterweights, which are offered as an optional element. The 21LC1050 is erected on a new tower section of 2.5 metres in width, compatible with the rest of the mast sections of the same with from COMANSA. In fact, this section, called D36B, will become the standard of other COMANSA models with similar sections, such as the 21LC750 or the LCL700 luffer. In its version with fixing angles, the 21LC1050 reaches a freestanding height of 73.3 metres, exceeding 98 metres when combined with other sections of the larger width from COMANSA. The hoist cable of the 21LC1050 is compacted and only 20 mm in diameter, which allows all hoist mechanisms to have drums with high rope capacity. The standard mechanism, 65 kW, has the capacity for 720 metres of wire rope and reaches speeds of up to 166 metres per minute in the versions of 25 and 37.5 tonnes, and 83 m/m in the 50 t version. For projects in which it is necessary to reach higher speeds (up to 300 metres per minute), two optional mechanisms are also available, of 110 and 132 kW respectively, as well as the possibility of issuing with Lebus drums with capacity for 1,570 metres of rope. Thanks to COMANSA’s single-double trolley system with automatic reeving change, the 21LC1050 crane always has an optimized load diagram. Working with the simple (or front) trolley, the crane improves its tip loading capacity and reaches higher hoist speeds. With the double trolley (front plus rear), the crane can work with the heaviest loads. For those projects where heavy loads are constantly being lifted and the crane does not require reeving change, the 50-tonne version has a simple trolley as an optional element. Like the rest of COMANSA's Flat-Top models, the 21LC1050 comes standard with the PowerLift system, which allows the crane to improve the load diagram by 10%, always without exceeding the nominal capacity. In this way, if the jib-end load of the 25 t model is 10,800 kg, when the crane driver operates the PowerLift system from the controls, the maximum load at the jib end increases to 11,880 kilos. Along with the 21LC1050 also new is its climbing cage, the J3-20. This hydraulic cage is compatible with other models from COMANSA, like the LCL700 luffing-jib crane, and has a pushing force of 200 tonnes, greater than any other jacking cage for 2.5-metre-wide mast sections from the manufacturer. In addition, this new cage introduces other novelties with respect to other COMANSA cages, since it speeds up the climbing process and reduces assembly time. The 21LC1050 comes standard with the new CUBE cab in its XL version, the most spacious from COMANSA. This cabin, which has received the prestigious "If" design award, ensures great productivity thanks to its fully glazed front and provides great comfort to the operator of the machine. Thanks to its maximum load of 50 tonnes, the 21LC1050 becomes the largest capacity crane of the successful COMANSA 2100 Series, formed entirely by flat-top models of large tonnage. Among all the range, this crane is only surpassed by the LCL700 luffer, with 64 tonnes of maximum load, and the Flat-Top models 30LC1100 and 30LC1450, which have maximum loads of 64 and 90 tonnes respectively.